4 chambres, 3. 5 salles de bain maison dans un quartier exclusif! Venez passer quelques "vacances Moments magiques" dans ce presque front de mer 4 chambres, 3. 5 maison de bain dans un quartier exclusif à la partie nord de Wrightsville Beach! Joliment meublé et conçu pour votre confort le plus élevé à l'esprit. Profitez du soleil et de l'ombre de ses nombreuses zones de plate-forme. Le niveau du sol dispose de 2 garages, en plus d'une grande salle "traîner". Profitez des moments tranquilles dans le joliment aménagé, cour privée. Le niveau principal dispose d'une cuisine bien équipée avec vue sur l'océan. Le salon / salle de vie ouvert dispose de parquet, cheminée à bois et bar avec petit réfrigérateur. Il y a 2 chambres et 2 salles de bains à ce niveau ainsi une véranda confortable à la chambre arrière qui ouvre sur le grand pont parfait pour se divertir ou se détendre tout en profitant de la vue sur l'océan et la brise! Le dernier étage dispose de la chambre de maître avec terrasse privée offrant une superbe vue sur l'océan. Aussi à ce niveau sont 1 chambre d'hôtes et 2 salles de bains. Votre famille adorera cette maison et que vous voulez revenir année après année! Il y a un ascenseur pour votre commodité. Clôturé Douche extérieure. Un garage et un grand parking hors rue. Occupation: 8. Interdiction de fumer. Pas d'animaux de compagnie. This home was gorgeous. Plenty of room for our big family. The elevator was a nice feature and we used it for lugging groceries and luggage. We would love to stay in this home again. The views of the ocean can't be beat. First, if you’re looking for a spacious, perfectly positioned beach house with the best location, this is the house for you. The home had a 360 degree view of the water and you can hear the waves crash. 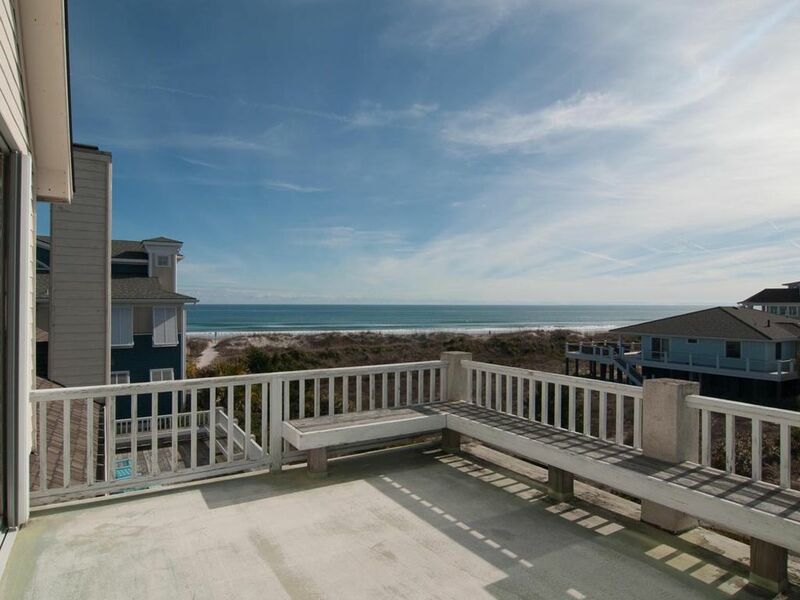 It is a 2 minute walk from front door to ocean waves which is perfect for guests of any age. The home is great for entertaining or just relaxing with the family. There are wrap around porches and the only problem you will have is choosing which part of the gorgeous scenery to gaze at. We stayed with a family of 4 and Grandpa and had more space than we needed. The house also has an outdoor shower and hose where you can rinse off after the beach. Everything about the house is super convenient for beach going. This was a great hike and we were sad to say goodbye to this piece of paradise. Thank you for your feedback. We wanted to let you know that we went to inspect the property per your concerns and will be working with the owner. The exterior furniture is weathered, but still robust and safe. The exterior of the house does have some paint that has faded exposed wood. We will work with the owner in the off season to address these concerns. Thank you again for the feedback and we are looking forward to facilitating your next vacation! Update(6/30): The owner has been to the property for a mid season sprucing!! A new outdoor table and chairs have been purchased. 4 of 6 new chairs have been delivered, the last 2 chairs and new table will be delivered in a few weeks. Additionally, the owner did some pressure washing and some railing painting around the perimeter as well as purchasing some new kitchen utensils and home essentials. The exterior paint will be a larger project and will be evaluated during the upcoming off season. Thank you again for the feedback. We have stayed at Magical Mermaid previously and it is a great family vacation beach house. Our only negative comment is the house could use a better cleaning in areas like under sofas (we had crawling children). We love Magical Mermaid and have stayed there for 7 or 8 summers. Great location. Love the patio and deck area. Great views. There have been some upgrades to the property which are nice, but the beds upstairs in particular really need new mattresses. Also, the blankets and comforters need to be laundered! We love this house and the north end of Wrightsville. It is the perfect family-friendly vacation spot! The house was wonderful, great mattresses, filtered water, spacious with extended decks, Bryant staff very helpful. Disappointed that there were no garage door openers which made using the garage for cars difficult. The Bryant Envelop we were given had the wrong WiFi code. and password.